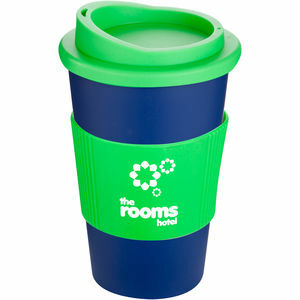 Our original British-made Americano Thermal Mug offers you amazing choice when it comes to creating your perfect mug. We have twenty two colours and finishes for you to choose from for your mug body, including solid and translucent colours, plus a glossy white. For 2015, we’ve added in a mid-blue colour, ideal for a wide range of brands. We then have twelve colours to choose from for your lid. If you choose to print directly to the mug, we can print up to six colours around the mug, giving you a massive branding area. Alternatively, you can add your branding to our soft-feel silicone grip, available in thirteen colours. The mug is top-rack dishwasher safe, microwave safe and BPA free.